Regular readers will know from my hotel reviews that I was out in Hong Kong, Japan and China over Easter. By coincidence, Anika was also in Tokyo for a few days as a guest of Japanese airline ANA / All Nippon Airways. If you are considering travelling to Japan, the obvious options – especially if you want to earn Avios and British Airways tier points – are British Airways (two flights per day) and Japan Airlines (one flight per day). 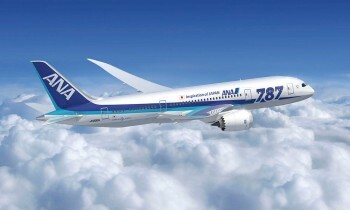 There is a third airline flying directly from Heathrow to Tokyo – ANA. ANA runs a daily service, departing at 7pm. It flies to Tokyo Haneda, which is substantially more convenient than Tokyo Narita, used for one of the BA services. ANA is a member of Star Alliance. This means that you can credit ANA flights to Lufthansa Miles & More, United MileagePlus, Singapore Airlines Krisflyer, ANA’s own Mileage Club or whichever other Star Alliance airline you prefer. You can also credit ANA flights to Virgin Flying Club. ANA offered us a complimentary return Business Class ticket to Tokyo to review their seat and service. You can read Anika’s two part review tomorrow. As usual, Head for Points paid for all of its other expenses including hotel costs in Tokyo. You can obviously redeem miles from any of the Star Alliance airlines for reward tickets on ANA. You may not know, however, that ANA is also a Virgin Atlantic partner. You can redeem your Virgin Flying Club miles for tickets on ANA. Even better, the rate is VERY attractive, especially when compared to an Avios redemption. You can also earn Virgin Flying Club miles when booking cash tickets on ANA, if you want to steer your next business trip their way. You can see the Virgin Flying Club earning and spending chart for ANA on this page of the Virgin Atlantic website. Note that one way redemptions are not possible. The price gap between Avios and Virgin miles is stunning. Even with a British Airways American Express 2-4-1 voucher, it is STILL a better deal to use Virgin miles most of the time when travelling Business or First Class. Even better, there are no fuel surcharges added to ANA redemptions using Virgin miles. You will have to pay the usual Air Passenger Duty, Heathrow departure taxes etc. If you can’t find availability on the ANA flights from London, they also fly to Tokyo from Frankfurt, Munich, Dusseldorf, Brussels and Paris. Virgin appears to have the same availability as Star Alliance partners and the Aeroplan (Air Canada) and United Airlines websites are both decent places to search for seats before calling Virgin to book. So …. if my recent reviews have made you consider Japan for your next holiday, you should be seriously considering flying ANA using Virgin Flying Club miles. Anika’s review tomorrow will give you a good idea of what to expect in Business Class. The ANA F product is superb. For those that love to look out the window the ANA F seat is quite enclosed and offers limited visibility but otherwise a fantastic place to be for anyone. I myself have 14 hours of JAL F from JFK to NRT. Looking forward to that Salon Blanc de Blancs! Trying to find F availability on United website – ANA from LON to TYO, I’m struggling to find any direct flights…? Same here. Spent 15 mins and only managed to find one date, in economy. Any tips for using the United site? Looked like you had to search day-by-day (the month overview included multi-stop availability). Any times of year when there’s loads of availability? Do they still do the Lexus transfer ? This would be an ideal redemption for me but I fear I will not be able to find the flights! I called yesterday but could not find any availability for any dates released for 2018 so far. A great deal in theory but the reality is very different!